Traffic on the Shimla-Kalka highway was disrupted after a huge rock blocked the road near Shogi, about 14 km from here. The rock fell on the road at 11 pm yesterday and it took almost 12 hours for the Public Works Department to the make way for one-way movement of vehicles. Huge surge in tourist inflow to the hill state in recent years has not made any difference to fortunes of the Himachal Pradesh Tourism Development Corporation (HPTDC) which continues to incur losses year after year. Tourists travelling by Delhi-Manali Volvo buses, run by the Himachal Pradesh Tourism Development Corporation (HPTDC), the HRTC and private players, accused the operators of cheating them by charging Rs 1,100 per seat. High cost of land and tedious and time-consuming acquisition process are proving to be major bottleneck in implementation of road projects. Peeved at being denied their due compensation in lieu of damage to their houses incurred due to flow of debris from the JP cement plant, about 300 villagers have blocked the gate of the cement unit since last evening at Bagha. The fund-starved Hamirpur Nagar Parishad received a financial jolt as the central government decided to curtail financial grant under the small town development project for the town from Rs 12.65 crore to Rs 5.48 crore. The immersion of golden ‘minjars’ (top blossoms of the maize plant) with coconuts on the banks of the Ravi by Chief Minister PK Dhumal marked the conclusion of eight-day-long international Minjar fair here today. The Rashtriya Swasthya Bima Yojna (RSBY) will be a boon for 2.44 lakh below poverty line (BPL) families in the state who are now entitled to financial assistance up to Rs 30,000 for undertaking treatment in recognised health institutions. The state government has taken a number of steps for the empowerment of women in the hill state. It took lead in increasing the quantum of reservation for women in the Panchayati Raj and Urban Local Bodies from 33 to 50 per cent to ensure their active involvement in development activities at the grassroots. Chief Minister Prem Kumar Dhumal announced that the state government has sanctioned construction of 5-km-long Holi-Utrala tunnel beneath the snowy Jalsu Pass and draft project report in this regard has been advertised. Unknown to many, bronze sculpture art has been flourishing in a small pocket in Chamba district of Himachal. The district administration and the Billing Paragliding Association last evening managed to recover the body of Russian para-glider Alaxi who went missing on October 23, 2009, after taking off from Billing. Dr Sulakshna Puri, Project Director, Himachal Pradesh, AIDS Control Society, was awarded “Bharat Jyoti Award” for her contribution in prevention of AIDS and successful implementation of special schemes for people living with HIV/AIDS by India International Friendship Society, an international NGO in New Delhi yesterday. The ninth session of the Himachal Pradesh assembly will begin here on August 17. Health Secretary PC Dhiman made a surprise visit to the Regional Hospital here that has been in the news since the past few months. The Horticulture Department has deployed 30 officers to monitor the procurement centres opened under the Market Intervention Scheme during the current apple season. A forest guard, Balkrishan, a resident of Jawali, drowned in Shah Nehar canal near Sathana village last evening. Himachal Pradesh University (HPU) has decided to continue with contractual appointments in teaching subjects at Postgraduate Centre and Regional Centre, Dharamsala. In a bizarre incident, one Pargat Singh, a resident of Kashipur in Uttarakhand, was arrested by the Solan police for firing into the air using his .32 bore licensed revolver while he was in an inebriated state at a farewell party in the Kotla Nullah area last evening. Traffic on the Shimla-Kalka highway was disrupted after a huge rock blocked the road near Shogi, about 14 km from here. The rock fell on the road at 11 pm yesterday and it took almost 12 hours for the Public Works Department to the make way for one-way movement of vehicles. Hundreds of vehicles were stranded on both sides causing a huge traffic jam. The big rock could not be moved with the heavy earth moving machinery and it had to be manually broken into smaller pieces. However, the traffic jam continued throughout the day, as only-way movement was possible. Most of those stranded were tourists. According to reports reaching here, some link roads were also blocked due to landslides. Maximum damage was caused in the Nahan and Shilai areas of Sirmour where some pockets recorded over 150 mm of rainfall yesterday. The main road leading to Renuka and the Paonta-Shilai roads were also blocked. The links roads in the interior were still blocked. With the Met office forecasting more rain and thundershowers over the next four days the conditions of roads was not likely to improve. The apple growers were a worried lot as traffic blockades due to landslides was affecting the movement of trucks, thus creating problems in transportation of produce to various markets within and outside the state. The state attracted a record 1,14,37,155 tourists in 2009, 17 per cent more than the figure of 97,49,433 for 2008. However, a majority of hotels and cafeterias run by the corporation are still running in losses. Information obtained under the Right to Information (RTI) by Dev Ashish Bhattacharya, an RTI activist, revealed that the corporation had accumulated a loss of Rs 21.61 crore as on March 31, 2009, and as many as 32 out of the total 57 units suffered loss during 2008-09. Intriguingly, even hotels and restaurants in prime locations were not making profits. For instance, the Ashiana-Goofa restaurant, located in the heart of the state capital, suffered a loss of Rs 13.09 lakh. Similarly, Kullu draws maximum tourists but almost all units in the valley, including Sarvari and Silver Moon hotels, Raft and Monal cafes and Angler’s Bungalow, were in the red and together incurred a loss of over Rs 28 lakh. Other major loss-incurring units included hotel Jwalaji (Rs 18.92 lakh) located in famous pilgrim centre of Jwalamukhi, hotel Mandav (Rs 19.09 lakh) in Mandi, hotel Irawati (Rs 14.33 lakh) in Chamba, Tourist Inn Riwalsar (Rs 9.72 lakh) café Bilaspur (Rs 8.54 lakh), café Giri Ganga (Rs 9.85 lakh) and café Chanshal (Rs 8.26 lakh). The biggest drain on the earnings was the transport wing which suffered a loss of Rs 85 lakh. As per the response to RTI query regarding accountability for losses, the staff posted in the respective units was collectively responsible. Also there was no proposal for privatisation or selling any unit. Bhattacharya maintained that Ashiana-Goofa alone had a potential to generate a profit of over Rs 1 crore annually. This is evident from the fact that the move to lease out the property attracted a bid of Rs 6.51 lakh per month in 2005. Managing director of the corporation Subhasish Panda, who took over only last year, said the main reason for heavy loss in 2008-09 was additional burden on account of pay revision and heavy depreciation, particularly in respect of Volvo buses. The situation has improved as new appointments were being made on contract basis and online bookings were increasing steadily, raising occupancy in hotels, he added. They are also playing with the safety of passengers by plying buses which are in deplorable condition. These are hired from Delhi-based operators Rao and Patna Travels. The tourists told The Tribune that they had lodged complaints to the tourism department and the HPTDC transport wing at Manali. They resented that the tourism-run hired Volvo buses were of old models and broke down at regular intervals. They made the Manali-Delhi journey not only tiring, but also hazardous for the travellers, they charged. Despite more than 30 tourists, including an NRI from California, had written to the tourism department, the corporation continued to ply these even today, rued Jaydeep, a traveller. Even the seats were broken troubling the passengers, he rued. Even the HRTC and private operators are running the second-rated buses in the name of Volvo charging Rs 900 to Rs 1,100 between Manali and Delhi. “Their condition is no better”, they said. He added that they had two 2009 Volvo buses models with facility of thigh rest and charged Rs 1,180 per seat for the Delhi-Manali trip. AGM, transport, Devraj Sharma claimed that the complaints of the tourists were addressed as soon as these reached them. The World Bank-funded State Road Project has also been affected with the cost of land shooting from the estimated Rs 55 crore (2007 rates) to Rs 160 crore. Delay in acquisition of land because of mandatory procedure to be followed under which minimum time has to be given for various notices to be issued to land owners and also for filing claims has made matter worse. The government had announced early this year that it was considering to assign the responsibility of land acquisition to sub-divisional magistrates but no further action has been taken in the matter so far. The decision to award contracts for execution of various packages for upgrade of roads without obtaining forest and other mandatory clearances further delayed the work. Consequently, work on most of the 10 packages for upgrade of 435 km of roads, including widening of formation, realignment, new structures and pavement strengthening, which was to be completed between December, 2010, and June, 2011, has been behind schedule. The maximum achievement of 33 per cent has been on the 45-km Una-Barsar section being improved at a cost of Rs 98.94 crore. The progress in 45-km Barsar to Jahu section was 29 per cent and 15-km Jahu-Kalikhar 20 per cent. Contract for the 41.9 km Sarkaghat-Ghumarwin section is yet to be awarded. The worst performance has been in the two packages of Rs 354 crore for upgrade of Mehatpur-Una-Amb (11 per cent) and Theog-Kotkhai-Hatkoti-Rohru (9 per cent) sections being executed by Chinese company Longjian Road and Bridge Limited. While admitting that work had been delayed for various reasons, PC Kapoor, Principal Secretary, PWD, expressed the hope that at least eight of the 10 packages would be finished by June 2012, the stipulated deadline for completion of entire project. The initial progress was slow as excavation took much time. However, once strengthening and tarring starts, the work would gain momentum. Meanwhile, the Ghumarwin-Sarkaghat section and the Theog-Hatkoti section would be completed only in 2013. The delay would lead to cost overrun and the matter had been taken up with the World Bank for sanctioning additional funds. A team of the bank would arrive here next month to discuss the issue, Kapoor added. The villagers protested that the public works department (PWD) had failed to assess the loss correctly and while 700 rooms in total had been damaged, the compensation had been paid for barely 320 rooms. Though the issue pertained to 2008-2009, it had remained unsettled since then. Villagers argued that the cement unit was indulging in unscientific dumping of debris which found its way into their land and damaged their houses. While a couple of houses had been damaged, no compensation had been paid to them as yet, they alleged. Demanding immediate settlement of all pending dues, the villagers has now blocked the plant gate by parking a few vehicles there. Gauging the seriousness of the situation, the administration, including SDM Balbir Singh and Darlaghat DSP, have been trying unsuccessfully to resolve the issue by holding talks with the unit management and villagers. Officiating SP Ramesh Pathania said three reserves had been stationed there for maintaining law and order though the situation was under control right now. He, along with ADM, rushed to the spot to check the situation. According to the SDM, the dispute arose after villagers indulged in unauthorised construction of houses following notification of Section 4 and they demanded compensation for them as well. Though the PWD had assessed a few houses, the villagers did not allow the PWD to make complete estimates and there were cases where no rooms were found to have existed. They also refused to allow constitution of a committee comprising technical experts, villagers and unit management which could assess the loss and fix compensation. KP Sharma, director, JP Cements, said they were ready to pay whatever compensation was decided by the PWD. However, they would not budge under such pressure tactics of the villagers, he added. This multi-purpose project was submitted by the local nagar parishad to the central government through HIMUDA, the nodal agency in the state, to create public utilities in the town and detailed project report was submitted to create works worth Rs 12.65 crore. The project was to be financed under the urban development scheme for small and medium towns throughout the country for creating facilities through urban local bodies. Several activities like channelisation of drains, widening of roads in the municipal area and creating other facilities would be carried out under the project. Though the nagar parishad here started different works under the project and had already received Rs 2.24 crore and was confident to receive the entire amount of Rs 12.65 crore under the project, the central government reportedly agreed to grant only Rs 5.48 crore and cut back the amount of Rs 7.17 crore. “The central government has also not issued second instalment out of Rs 5.48 crore as the nagar parishad reportedly delayed in submitting utilisation certificate for the money received as first instalment in 2007,” the sources add. The Chief Engineer of HIMUDA said the money under the project was to be received through the Urban Development Department and we had only prepared the project proposal. But the central government had not approved many components submitted under the project and now the parishad would get a total of Rs 5.48 crore under the project. Nearly one lakh people, including tourists from the neighbouring states, participated in the festivities of the fair, which is one of the major tribal carnivals of the northwestern Himalayas. Earlier, a shobha yatra started from the Akhand Chandi Palace and passed through the main bazaars of the town. It converged on the right bank of the Ravi. The festival symbolises blooming of maize crop, which is the staple diet of people of this mountainous region. Those present on the occasion included Vidhan Sabha Speaker Tulsi Ram, Transport and Housing Minister Mohinder Singh, besides MLAs and district officers. Earlier, the Chief Minister who arrived here by a helicopter inaugurated a helipad terminal near Chamba and laid the foundation stone of an HRTC workshop at Sultanpur. Dhumal also laid the foundation stone of the proposed new bus stand at Tatwani in the town, a sewerage scheme, besides a pedestal path along the old bus stand. These poor families are not required to pay any premium to avail health insurance cover under the scheme for which Himachal recently won the National Award for “Best Enrolment Rate State”. Initially launched in Kangra and Shimla districts, the scheme has been extended to the remaining 10 districts from March 1, 2010. The state government has gone one step further by providing health insurance cover up to Rs 1.75 lakh in case of critical illness to help meet the expenses of hospitalisation and surgical procedures for treatment of diseases like cardiac and cardio-thoracic surgeries, genito-urinary surgery, neurosurgery, radiation oncology, trauma, transplant surgeries, spinal surgeries and surgical gastroenterology. The Centre has also awarded the state for successful implementation of the first phase of the scheme in Shimla and Kangra districts by issuing smart cards within the stipulated time frame. As many as 80,242 smart cards (54,511 in Kangra and 25,731 in Shimla) were issued, covering more than 80 per cent of the BPL families which was the highest in the country. So far, 3,107 patients have availed benefit under the scheme. Appreciating the vital role of gram panchayats in the implementation of the programme, the government has decided to give a cash award of Rs 50,000 to one panchayat in each district for maximum coverage under smart cards along with second prize of Rs 25,000 and third prize of Rs 10,000 as incentive. In the second phase, up to Rs 4,500 will be allowed for expenses related to maternity and newborn child as a part of basic sum insured of Rs 30,000. In all 127 public hospitals and 13 private hospitals have been empanelled for basic package and 18 public and private hospitals for critical care. A sum of Rs 1.8 crore has been made available to 24 families for critical illness Rs 25.15 lakh to 11 families for medical treatment under the scheme outside the state. Besides, a number of innovative schemes and programmes have been initiated to improve their socio-economic lot. The newly introduced “Beti Hai Anmol” scheme under which the government deposits Rs 51,000 in the name of the girl child aims at bringing an attitudinal change towards girl child in society. Scholarship is also provided under the scheme to the girl child. The amount is Rs 300 from class I to III, Rs 500 for class IV and V, Rs 7,00 for class VI and VII, Rs 800 for class VII and VIII, Rs 1,000 for class IX and X and Rs 1,500 for class XI and XII. “Mother Teresa Ashay Matri Sambal Yojna” is another scheme under which poor women who have annual income less than Rs 18,000 are being provided financial assistance of Rs 2,000 per child. Addressing mediapersons after inaugurating the newly constructed building of the office of the district public relations officer here today, he said the proposed tunnel would connect the Bharmour tribal region of the district with the Pathankot-Manali National Highway-20 and converge at Paprola in Kangra district. The tunnel will be the first in the state and reduce the distance of about 250 km to merely 54 km which is five times less than the actual distance via Pathankot. The Chief Minster said it was also for the first time that Chamba district had been allotted a national highway, which was a long cherished demand of the people of this hilly region. Vindicating his claim, the Chief Minister said he had held detailed discussions with Union Minister of Road Transport and Highways Kamal Nath at New Delhi in June and Nath agreed to declare five new national highways for the state. Dhumal said this had increased the number of national highways in the state from 11 to 16 adding that the new national highways approved included 133-km-long Pathankot-Dalhousie-Chamba-Bharmour, 59.7-km-long Hamirpur-Sujanpur-Palampur, 111.8-km-long Brahmpukhar-Bilaspur-Ghumarwin-Sarkaghat-Ladbhadol-Baijnath, 106.4-km-long Tara Devi-Jubberhatti-Kunihar-Ramshar-Nalagarh-Ghanauli and 83.9-km-long Chandigarh-PGI-Nalagarh-Ramshehar-Arki-Shalaghat roads. The art has been preserved by Dhadiar community of Chamba and passed since generations. 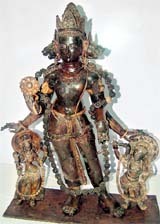 The Kangra museum this week hosted an exhibition of bronze work by artisans from Chamba district. The exhibition was held here under the aegis of the Languages and Culture Department. He said five types of scrap metals were used for making bronze sculptures. The mould and metal was heated to equal level. The liquid metal is then poured into the mould. After cooling, the mould is broken and sculpture recovered. Finer details of the sculpture are then completed with hand, Shandilya added. Curator of Kangra museum Ramesh Chandra said the theme of Chamba artists was generally sculptures present in temples of the district. According to artists, these days they made sculptures only on orders. “Since cost of sculpture is about Rs 2,000 per kg, we cannot afford to make and store the art pieces.” However, with a little government support, Chamba can come up as an international centre for making bronze sculptures, they added. Meanwhile, work of Chamba artists has already been recognised at the national level. Artists from the district have bagged 11 national awards in various categories in the recent years. Alaxi had come to India to participate in the Paragliding World Cup meet at Billing in October, 2009. A shepherd had spotted the body last week lying on the high hills. After three days’ efforts, the rescue party reached the high hills of Dhauladhar and recovered the skeleton of Alaxi along with his equipment. According to Palampur SDM Ratten Gautam, the Russian Embassy had been informed and the body of Alaxi would be handed over after a post-mortem examination at Tanda Medical College. Meanwhile, the Himachal Pradesh Tourism Department has decided to make flying laws more stringent so that such mishaps could be averted. A senior officer of the department, while talking to The Tribune, said Alaxi had no insurance cover but still was allowed to fly which was a serious lapse on the part of organisers. In fact, he had not got himself registered at the office of the Baijnath SDM who was monitoring the paragliding event, he added. “In future, no private gliding association would be allowed to organise such events which risks lives of the participants,” the SDM said. Had there been any insurance cover for Alaxi, helicopter service could have been availed to locate him, he added. Financial constraint was the major reason why the organisers could not conduct the rescue operation successfully, he added. In 2002, a similar incident had happened when Jyol Kichen, a pilot from England, had gone missing in the high hills of Dhauladhar. His body could not be traced in the past eight years. Former Tamil Nadu Governor Bhisham Narayan Singh presented the award to Dr Puri in the presence of Punjab Health Minister Laxmi Kanta Chawla, former director of the CBI Joginder Singh, veteran freedom fighter Major Ved Prakash, and other distinguished personalities at a function which was attended personalities drawn from all over the country. Her achievements include successful campaign of Beti Anmol Hai, Anaemia Free Himachal, Anti-Tobacco campaign, as she took keen interest in these areas. She also headed the Health and Family Welfare Department in the hill state which had achieved various distinctions in the health sector. Speaker of the Vidhan Sabha Tulsi Ram said in all there would be five sittings during the monsoon session which would conclude on August 23. One day had been earmarked for Private Members’ Business. He said during the session the House would also consider important legislative business. “I hope the members will utilise valuable time during the session for fruitful discussion on urgent matters of utmost public importance,” he said. He ordered that the doctors should prescribe medicines only on their generic names and not on branded names. He said non-compliance of these government orders would attract strict action. Dhiman also said doctors should remain in the hospital during duty hours and be available for patients and any complaints in this matter would be viewed seriously. Dhiman also visited a few patients and interacted with them. He also inspected various construction works carried out on the premises. Chief Medical Officer Dr HK Attri and other senior doctors also accompanied the Health Secretary. 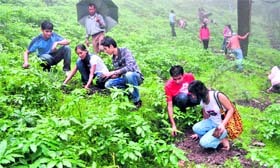 Horticulture Minister Narender Bragta, reviewing the arrangements made by the procurement agencies, Himfed, the APMC and the HPMC, here said one official would overlook the arrangements of 10 procurement centres and ensure that apples procured at these centres were transported to the processing centres. According to information, he was posted at Sathana. While walking near the canal during his duty hours his feet suddenly slipped and he fell into the canal. A local youth, who first noticed him, tried to save him by fishing out but he died. According to Jawali DSP Rakesh Singh, it was an accidental death and after conducting a post-mortem examination the body was handed over to his family. The matter has been reported under Section 174 of the CrPC. The decision was taken at a meeting of the Executive Council (EC) of the HPU chaired by Vice-Chancellor Prof Sunil Kumar Gupta. The EC also decided to adopt 3 per cent reservation for physically challenged candidates in cases of teaching posts. In view of the controversy over the pre-medical entrance tests, resulting in revision of CPMT-2010 result, the EC deliberated upon the matter and decided to issue proper instructions to the examiners that there was no confusion resulting in problems. The EC also decided to start PGDCA classes at Regional Centre, Dharamsala from the current academic session. The incident took place past midnight when Singh took out his revolver while celebrating the farewell party and fired five shots in the air. Singh works as a salesman in a fertiliser company and had come to Solan for the celebrations. The shots were heard by DSP (Vigilance) Ramesh Sharma who resides in the neighbourhood. He informed the police in the morning who then inspected the spot and recovered five empty cartridges from the spot. According to officiating SP Ramesh Pathania, Singh was arrested and a case under Section 27-54/59 of the Arms Act for negligent use of licensed weapon registered against him this morning.